Image from the CD "Yeshua" from "Music for Messiah". The YouTube video here contains a short 8 minute video. It is a brief overview of the Seven Jewish Feasts or Seven "Appointed Times". you may go directly to YouTube and see the video by clicking the image below. 4,000 years ago Abraham received a twofold promise from YHVH/God. He was promised not only a land, (Eretz Israel), with a City, Jerusalem), but he was also given a promise of descendants as numerous as the stars of heaven. (Gen.15:5) This "melo-hagoyim" or a multitude of nations/gentiles/goyim would come to salvation in precisely the same way the old saints of Israel came to salvation. They would be saved by the grace of the Almighty YHVH, the God of Israel, through the exercise of their own personal faith in the atoning blood of the sinless perfect Sacrifice Lamb He had promised. Eventually this company will be regathered. And this remnant would be saved and glorified together as one magnificent single restored united family, even a royal priesthood and a holy nation. Oh yes. The God of Abraham, Isaac, and Jacob is into "family values". He cares about His family in a very big way. We serve a God whose name is "Wonderful". - Isa.9:6 In Hebrew this word "wonderful" means "SURPRISE!!!" Hashem is leading His people onwards to new places they have never been before. The prophet Isaiah also spoke of His servant Israel being a "Light to the Gentiles/heathen/goyim". (Isa.42:6,49:6,60:3) The Old Testament poetry is full of very specific prophecy predicting the restoration of all Israel as a nation. (Isa.11, 60, 61, etc.) Exactly what this all means we have yet to discover. As we walk by faith believing we shall eventually come to fully understand these things. But obviously we are on the road to find out. The covenant people of YHVH-God are on a grand adventure. And the successive fulfillments of each of those Jewish Holidays are way points on the Road to Paradise. OR THE SEVEN FEASTS OF ISRAEL. The exodus from Egypt took place in approximately 1500 B.C. It was soon afterwards that God, through his servant Moses, instituted these Seven Feasts of Israel which form the basis of the Jewish Holidays. These seven Jewish Holidays are seven holy convocations laid out on the Hebrew calendar to be remembered and celebrated every year. Three of these are in the springtime, one is in the summer and three are in the fall. All seven of these holy days, (from which we get our word 'holiday'), are special occasions in which God calls His people aside from their usual day to day work. As the Israelites would go up to Jerusalem to the feast they would join with the whole assembly of God. There at the feast some key spiritual lessons would be demonstrated before their eyes. The Jewish Holidays also cause God's people to remember those epic events in their history. Because many of them happened to occur on those special auspicious dates on the Hebrew calendar. Each Jewish Holiday illustrates some essential truths relating to the Everlasting Covenant as it exists between the God of Israel and His people. The Jewish holidays also provide a wonderful occasion for parents to teach these precepts to their children. YHVH, the God who was, is and evermore shall be is the prime mover here. By His sovereign will He is unfolding a magnificent agenda here on this earth. He is in the process of redeeming, sanctifying and eventually glorifying a company of people from lost mankind.At the same time He is defeating Lucifer and the angelic powers of darkness. So these Jewish holidays are not just quaint religious customs exercised by a religious minority harking back to a scattered Jewish nation and a lost, divided, and forgotten Kingdom of Israel. The Jewish Holidays are each waypoints on a road map for pilgrims. They show God's Judeo-Christian people where they and their God have been so far in holy history. And also, more particularly, they indicate quite clearly the Way home! FOUR JEWISH HOLIDAYS HAVE ALREADY BEEN FULFILLED. THREE OF THEM ARE AWAITING FULFILLMENT. 2. Feast of Unleavened Bread Fulfilled! 3. Feast of Firstfruits Fulfilled! 4. Feast of Pentecost Fulfilled! 5. The Feast of Trumpets Unfulfilled ....(as of yet). Tishrei 1, on an epic future Jewish New Year. 6. The Day of Atonement Unfulfilled ....(as of yet). On some future Yom Kippur, (Tishrei 10), this ultimate climactic day of awe will unfold. This will be seven years after that epic future Feast of Trumpets. This epic future Day of Atonement will wrap up all the celebrations of Yom Kippur that have gone before it. This will be the final Day of Reckoning, the wrap-up day not only for that year, but for that sabbatical year cycle, that 49 year Jubilee cycle, and indeed the final day of accounting for this entire evil age! Holy history for this era will have come to its blockbuster climax. The next day, the day after this climactic Yom Kippur, the Day of the Lord will open up. Judgment Day will have arrived! And as "the Breaker" He will come to Bozrah (Isa.62,Mic.2:12-13) to "break out" His exiled people from lost Israel and from among the nations. He will deliver His people in exile in the magnificent Bozrah Deliverance. This was the huge company of Tribulation Saints John saw. (Rev. 7) A remnant shall return, drawn out from Israel, from the Church, and from the gentile nations. 7. The Feast of Tabernacles Unfulfilled ....(as of yet). Tishrei 15 will come five days after that final epic Day of Atonement. This will mark the coming of Messiah to tabernacle with His covenant people. Thus begins the long awaited 1000 year Millennium of Messiah. 2. "Speak to the children of Israel, and say to them: 'The feasts of the Lord, which you shall proclaim to be holy convocations, these are My feasts. 3. 'Six days shall work be done, but the seventh day is a Sabbath of solemn rest, a holy convocation. You shall do no work on it; it is the Sabbath of the Lord in all your dwellings. 4. 'These are the feasts of the Lord, holy convocations which you shall proclaim at their appointed times. 5 On the fourteenth day of the first month at twilight is the Lord's Passover. 6 And on the fifteenth day of the same month is the Feast of Unleavened Bread to the Lord; seven days you must eat unleavened bread. 7. On the first day you shall have a holy convocation; you shall do no customary work on it. 8 But you shall offer an offering made by fire to the Lord for seven days. The seventh day shall be a holy convocation; you shall do no customary work on it.' "
10. "Speak to the children of Israel, and say to them: 'When you come into the land which I give to you, and reap its harvest, then you shall bring a sheaf of the firstfruits of your harvest to the priest. 11. He shall wave the sheaf before the Lord, to be accepted on your behalf; on the day after the Sabbath the priest shall wave it. 12. And you shall offer on that day, when you wave the sheaf, a male lamb of the first year, without blemish, as a burnt offering to the Lord. 13 Its grain offering shall be two-tenths of an ephah of fine flour mixed with oil, an offering made by fire to the Lord, for a sweet aroma; and its drink offering shall be of wine, one-fourth of a hin. 14 You shall eat neither bread nor parched grain nor fresh grain until the same day that you have brought an offering to your God; it shall be a statute forever throughout your generations in all your dwellings. 15. 'And you shall count for yourselves from the day after the Sabbath, from the day that you brought the sheaf of the wave offering: seven Sabbaths shall be completed. 16 Count fifty days to the day after the seventh Sabbath; then you shall offer a new grain offering to the Lord. 17. You shall bring from your dwellings two wave loaves of two-tenths of an ephah. They shall be of fine flour; they shall be baked with leaven. They are the firstfruits to the Lord. 18. And you shall offer with the bread seven lambs of the first year, without blemish, one young bull, and two rams. They shall be as a burnt offering to the Lord, with their grain offering and their drink offerings, an offering made by fire for a sweet aroma to the Lord. 19. Then you shall sacrifice one kid of the goats as a sin offering, and two male lambs of the first year as a sacrifice of a peace offering. 20. The priest shall wave them with the bread of the firstfruits as a wave offering before the Lord, with the two lambs. They shall be holy to the Lord for the priest. 21. And you shall proclaim on the same day that it is a holy convocation to you. You shall do no customary work on it. It shall be a statute forever in all your dwellings throughout your generations. 22 'When you reap the harvest of your land, you shall not wholly reap the corners of your field when you reap, nor shall you gather any gleaning from your harvest. You shall leave them for the poor and for the stranger: I am the Lord your God.' "
24. "Speak to the children of Israel, saying: 'In the seventh month, on the first day of the month, you shall have a sabbath-rest, a memorial of blowing of trumpets, a holy convocation. 25 You shall do no customary work on it; and you shall offer an offering made by fire to the Lord.' "
29 For any person who is not afflicted in soul on that same day shall be cut off from his people. 30 And any person who does any work on that same day, that person I will destroy from among his people. 32 It shall be to you a sabbath of solemn rest, and you shall afflict your souls; on the ninth day of the month at evening, from evening to evening, you shall celebrate your sabbath." 34. "Speak to the children of Israel, saying: 'The fifteenth day of this seventh month shall be the Feast of Tabernacles for seven days to the Lord. 36 For seven days you shall offer an offering made by fire to the Lord. On the eighth day you shall have a holy convocation, and you shall offer an offering made by fire to the Lord. It is a sacred assembly, and you shall do no customary work on it. 38 besides the Sabbaths of the Lord, besides your gifts, besides all your vows, and besides all your freewill offerings which you give to the Lord. 40 And you shall take for yourselves on the first day the fruit of beautiful trees, branches of palm trees, the boughs of leafy trees, and willows of the brook; and you shall rejoice before the Lord your God for seven days. 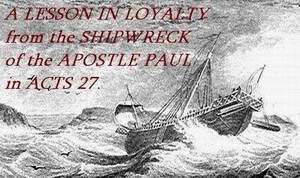 41 You shall keep it as a feast to the Lord for seven days in the year. It shall be a statute forever in your generations. You shall celebrate it in the seventh month. 43 that your generations may know that I made the children of Israel dwell in booths when I brought them out of the land of Egypt: I am the Lord your God.' "
AND FOR THE PEOPLE AND ECOSYSTEMS OF THIS WORLD. The Jewish Holidays are not just quaint religious celebrations. These seven sacred convocations lay out God's agenda for the redemption of man, the judgment of the wicked, and the restoration of the cosmos in the Millennial Age to come. This plan was decreed in heaven from before time began. God has an ongoing program in place and it is in full operation. Holy history runs forward in teleological fashion. History is not just another endless meaningless circle in the pattern eastern mysticism. Hinduism, Buddhism, and the western pantheism of the college campuses sees life as little more than the ceaseless and repetitive cycles of summer and winter, life and death, marriage and funerals. But life is more than just a balancing act between the 'ying' and the 'yang', the positive and the negative forces of nature. This pitiful empty and impersonal message of the spirits beyond the Indus River is all that eastern mysticism can offer a lost mankind. It doesn't work, and a trip to Calcutta will soon bring that point home. The God of Israel is the God of history. And He has something infinitely better to bring to the table. The God of Abraham, Isaac, and Jacob is the God of Salvation. And He has a plan and a purpose which is unfolding as we move forward in time. The God of Israel is the Alpha and the Omega. He IS the I AM. And He is the beginning and an end of all human history. Life has meaning. The Holy One of Israel is telling the story here on earth. History is an ongoing demonstration of His truths. They are expressed in the lives of men and nations. History is His-Story. There is a plot and there is a counter plot. The story has a main character in Messiah. He is the anointed One who comes into our cosmos. And the main antagonist is Lucifer who is the god of self. A host of other characters are introduced to us in the Holy Scriptures. They are showcased in the matrix of the story. Obviously, by looking at the unfolding Jewish Holidays, we can see that YHVH-God has not finished yet. He is still calling for people to fulfill a host of magnificent roles as the play of the ages comes to its magnificent climax. The end of this particular saga human history has a final contest. And it has a grand climactic conclusion as the Day of the Lord opens. This will be followed by a resolution at the end. YHVH-God will be returning into this cosmos as Messiah. And He will tabernacle with His people for a thousand years. There will be many surprising revelations. God is the sovereign author of our faith. He is the active agent here. So we know that the conclusion of the story will be more glorious than we can presently imagine. Furthermore, God is now operating in ever increasing ways through His covenant people as the Light to the Gentiles brings a melo hagoyim back into Israel. Our sovereign God alone has written and is now choreographing the play of the ages. And He is well underway with His epic saga. They are laid out for us in the Seven Feasts of Israel. Four acts/feasts are finished. Three (or four) acts/feasts are left to go. Eventually we are going to realize that this is pretty exciting. And as we look at the Jewish Holidays and in particular the final Fall Feasts it soon becomes obvious that we are not just passive theological observers in all this. The lives of each one of us will be woven into the story. God only knows what adventures and wonders lie ahead of us. As the Jewish Holidays progressively unfold our involvement as covenant partners with YHVH/God is on the increase. Now is the time for us to get to know our God and to learn to walk with Him. 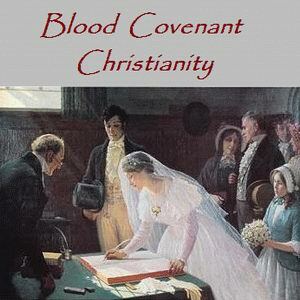 Because at some point in the future Israel and all of God's covenant people will be going up onto the stage of history. We need to know our God and find salvation in Him. Because the climax to history will be played out in some future seven year time period. The trumpets will be blowing. And the curtain of holy history could open up on the end time drama. We need to prepare ourselves in YHVH-God. Becaus this epic future history could well unfold in our lifetime! All of these seven Jewish Holidays were celebrated in the old covenant by the nation of Israel. The first three of the feasts, the spring feasts, have already been fulfilled in the New Covenant. They were fulfilled by Yeshua Himself. Jesus fulfilled two thousand years ago and right on the set times. 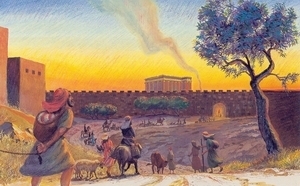 The first coming of Messiah was as the prophesied Suffering Servant in which He fulfilled the first three feasts precisely on those feast days of the Jewish calendar He was crucified on Passover, buried as the sinless Bread of Heaven on Unleavened Bread and rose from the tomb on Firstfruits as the firstfruits from the dead. The first coming of Messiah 2,000 years ago was witness to an astounding event. The Feast of Firstfruits in 32 A.D. saw the Resurrection of Messiah. 50 days later the summer Feast of Pentecost saw another epic fulfilment of a Jewish holiday. The Holy Spirit fell upon the 120 in the upper room in Jerusalem. This begin the expansion of the Congregation of Israel as it overflowed out beyond Judah to the lost tribes, the heathen, the goyim, or the gentiles. (Eph.2:12-13) The spectacular events of that landmark summer feast is recounted for us in the first two chapters of the book of Acts. 3. Succot, the Feast of Tabernacles. The three fall Jewish Holidays have not yet erupted or become manifest in holy history. The first two of the three are now the subject of much discussion and speculation. Nevertheless, we have plenty of clues from scripture to indicate to us what these epic future Jewish Holidays might mean as future history unfolds. In particular, we know that the confirmation of the seven year 'covenant with many' Daniel mentions in Dan. 9:27 is the next big event that history awaits. This day of blowing of trumpets will initiate the 70th week of Daniel and usher us into the final seven years of this present evil age. This will be a very important time period in future holy history. The signposts in and out of that last seven years are almost certainly the Jewish holidays #5 and #6. These auspicious dates on the Hebrew calendar will most certainly give birth to epic events of major spiritual significance. In was in the investigation of this possibility that the author made a significant discovery back in 2003. The 1290 days mentioned by the prophet Daniel in Dan. 12:11 fits the time period between Tishrei 1 and Tishrei 10 seven years, (86 moons) later to the very day. It is a perfect fit! 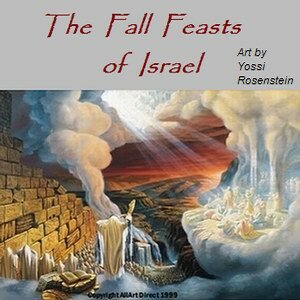 (See the article on the Fall Feasts of Israel. The Feast of Tabernacles is the final of the seven Jewish Feasts. It is the feast that follows five days after the awesome final Day of Atonement. As we explain, it is highly likely that the Day of Atonement will erupt into holy history as the last day of this present evil age. It is only appropriate that the final Day of this age is the ultimate climactic Day of Reckoning or Day of Atonement. The Day of the Lord will open up that evening at sunset. Just as the Day of Atonement ends our returning Messiah will be at the door. The Feast of Tabernacles is the natural sequel to all these judgments. Messiah will return to establish His Millennial Kingdom here on earth. Tabernacles is a joyful celebration. It recalls the time when the Israelites lived in booths or tents as they camped out in the wilderness for forty years. Many Bible students agree that the Feast of Tabernacles will find its ultimate New Covenant fulfillment in the Millennium of Messiah. Jeshua will come down Jacob's Ladder. Once again Yeshua Hamashiach will come into our cosmos as Emmanuel, "God with us". He will be coming down here to be among His people. He will be conducting a wonderful "camp meeting" with His people for a thousand years. So the last three feasts on the Hebrew calendar, the Fall Feasts of Israel, have not yet been fulfilled. They are yet to erupt into holy history. They are up their in our future. So our studies in the Feast of Trumpets and the Day of Atonement have been providing some wonderful and unexpected surprises. We shall describe these amazing discoveries as we proceed onwards in our study of the Jewish Holidays. These discoveries are described in the article on the Fall Feasts of Israel. Grace and shalom to all the saints.